School gold medal is a special insignia. It deserves only the best students who throughout high school had consistently affirmed their knowledge of the grade "excellent" in all subjects. The history of awarding medals in Russia for outstanding achievements in the study of school disciplines began in the 19th century, in 1928. Legally, this procedure was enshrined in the "Charter of gymnasiums and schools of the County and parish". In Soviet times, this tradition was resumed in may 1945. In our time, a gold school medal first lost his power, the most expensive awards for successful school work – she stopped bringing benefits to enroll in higher education, and then it does replace a certificate of special sample. Surprisingly, in a country that had just defeated fascism and returned from the war, was returned to the Institute medals. For excellent studies at school and good behavior", it says that adorned each copy was written in all the languages of the Soviet republics. The evolution of the school awards were so. Graduate of 1945 was given the coveted award, which consisted of gold higher, 583, which had a diameter of 32 mm and weighs nearly 10.5 ounces. In 1954, the gold medal was replaced with a lower sample – 375, there was a technological change in the process of obtaining alloy, and she herself became much easier and began to weigh about 6 grams. In 1960, there were new instances. School medals are made of red brass and coated with gold by sputtering. The precious metal remains only in the coating, the amount there was 0.2 grams. With the collapse of the Soviet Union, Russia established the Institute medals. They are made at the Moscow factory Goznak. In the final they were decorated with coat of arms with enamel ribbon of the colors of the Russian tricolor. On the medal were struck gold plating with a thickness of 5 microns 999.9. Thus, the amount of precious metal it was 0.31 gram gold. The cost of school gold medal was 300 rubles. 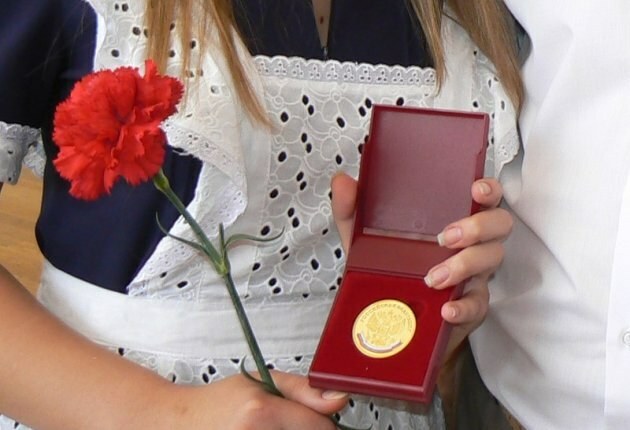 In prerevolutionary Russia, a gold medal can only be obtained, if the graduate had a solid rating of "excellent" in three subjects - Latin, Greek language and mathematics. All the rest had to be within 4.5 of the ball. In the USSR the medal was given, if all the scores in the last graduating class was "excellent". Valued a Titanic work, vanity and ambition. The award was of great value in the eyes of others and provided good privileges at receipt in higher educational institutions – instead of four entrance exams you can take just one, but "excellent". The status of the medal was high at all times of existence. In Russia, when removed incentives for admission, which they gave a medal its value is leveled. The younger generation of pragmatists no longer aims to spend her extra effort.